I don’t know about the rest of you, but when it comes to pie crust I get a bit nervous. Too dry, too wet, not tender or flaky enough… and always somewhat difficult to handle. This recipe is (hopefully) meant to take something that is time-consuming and a bit nerve-racking, and make it a bit simpler. Taking a pre-made pie dough and filling from a jar, you can whip up some postage stamp-sized treats that keep wonderfully in the freezer until you’re ready to use them. 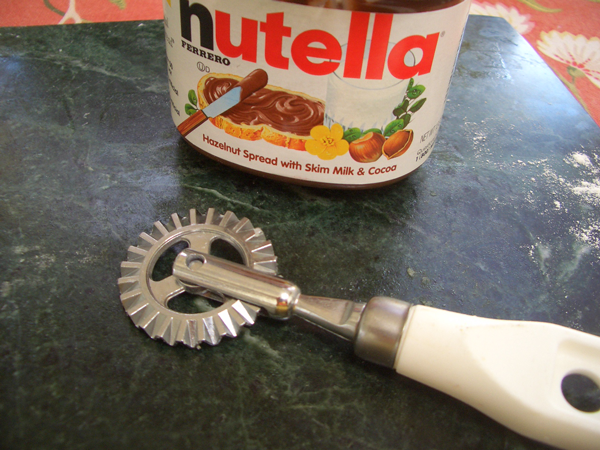 I used Nutella because it’s what I had in the cupboard. Lemon curd or any jam would also work. 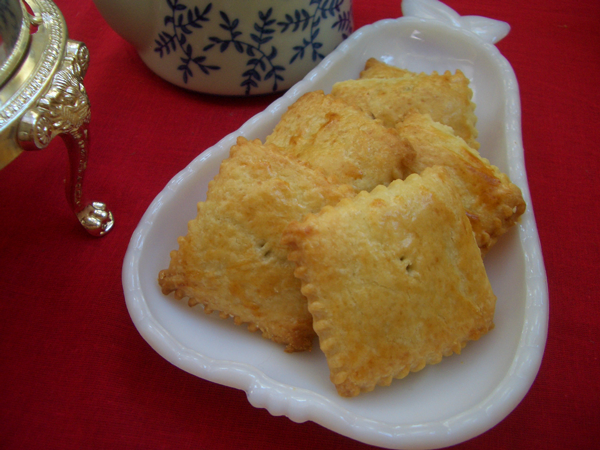 It goes without saying that you can use homemade pie crust for this recipe. Defrost pie crusts according to directions on box. Unroll crusts but keep them on the paper/plastic rolled around them. Lightly dust a rolling pin with flour, and roll the crusts a bit thinner; scrunch together any holes in the crust. Don’t worry if the crusts are irregularly shaped; just try to get them to approximately the same shape and size. 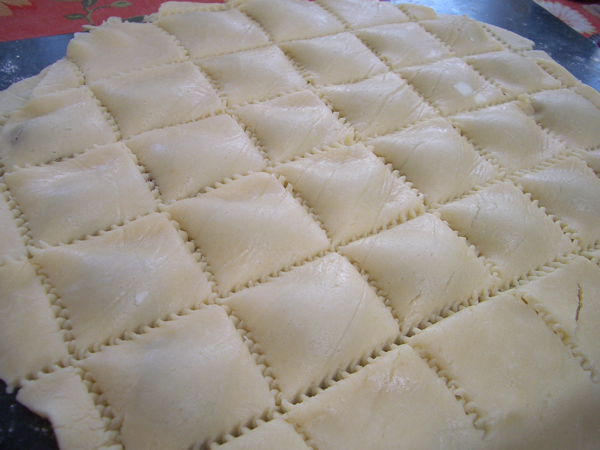 Using a ravioli crimper, make horizontal and vertical lines to approximate the size of the pies you’re making. 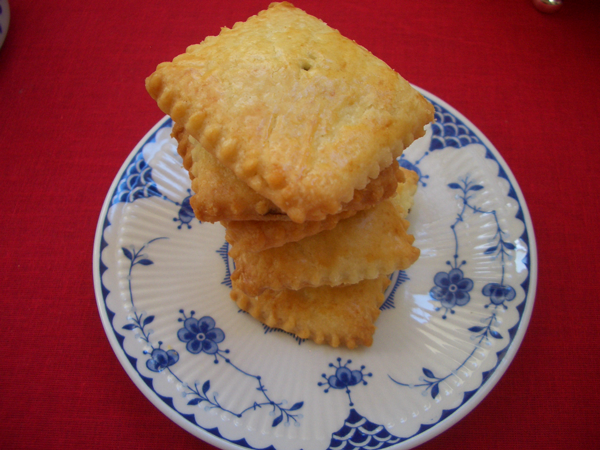 Approximately 1-1/2 inches (4cm) square per pie. 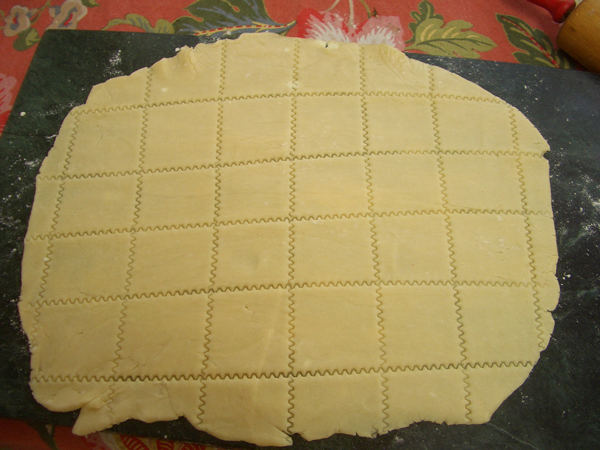 If using a knife, don’t cut all the way through; instead, lightly trace your lines in the dough. 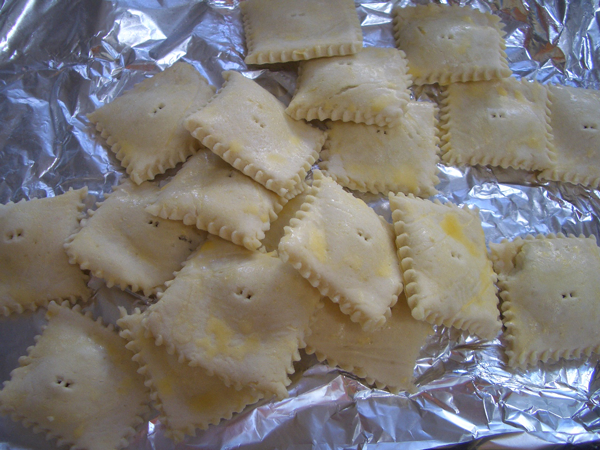 Add a dollop of filling to each square. Don’t over fill. Using a pastry brush, brush water along the spaces between the filling to help the dough stick together when you add the second layer. Keeping the second layer of crust on the paper/plastic, turn it over onto the filling layer, doing your best to keep everything aligned. Don’t worry if you miss the mark a bit, and don’t try to peel it off and try again, you’ll just smear things around. Let gravity do the work for a few minutes, and let the top layer of dough settle over the filling, creating little mounds. Gently press down between the mounds of filling to help the dough adhere. 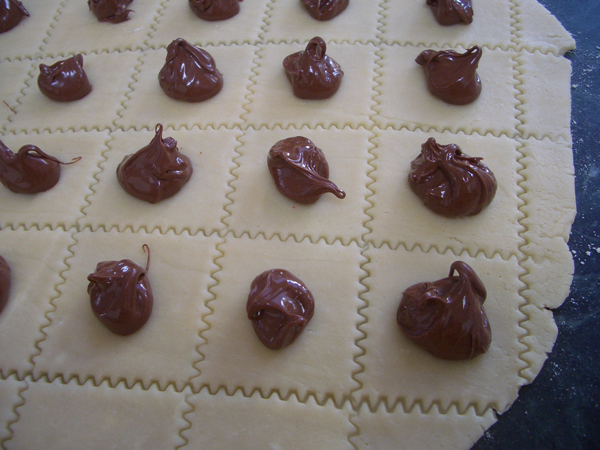 Using the ravioli crimper, cut through both layers to form the pies. If using a knife, cut through, separate the pies, and crimp the edges with a fork. Separate the pies. Check the edges to make sure the seams are closed. 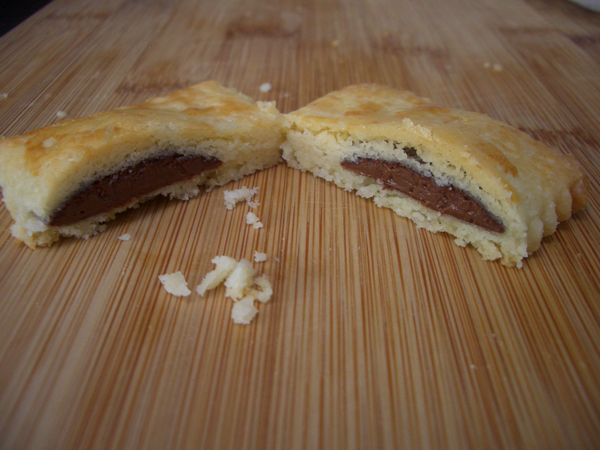 Gently press any open seams together to prevent the filling from leaking out during baking. 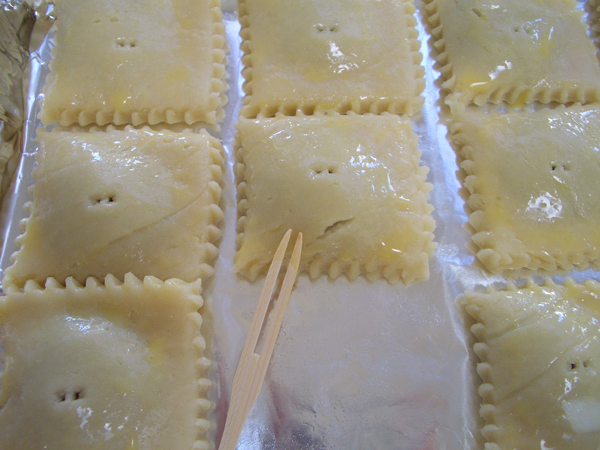 Using a toothpick or skewer, poke a few small holes in the top of each pie to release steam. 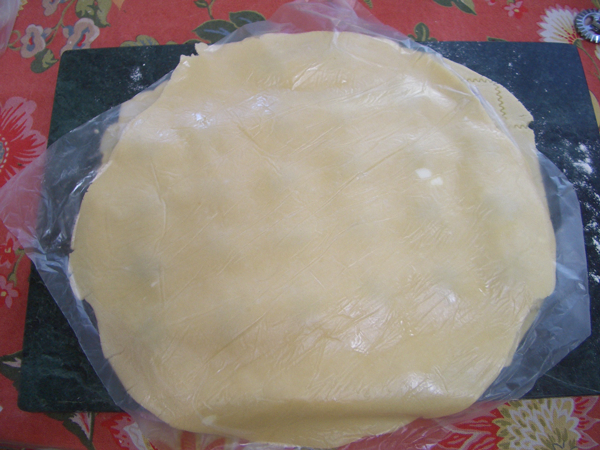 Place pies on an aluminum or parchment-lined baking sheet. Brush lightly with egg wash.
At this point, you can bake or freeze the pies. If freezing, put the entire baking sheet in the freezer uncovered for about 30 minutes until the pies are firm. Put in freezer bags. If baking, bake in preheated oven for 15 minutes until golden brown. Dust with confectioner’s sugar if you like, or leave plain.